The LEGO DC Comics Super Heroes The Awesome Guide Hardcover Book introduces the world of the LEGO DC Comics Super Heroes mini-figures, including heroes, villains, gadgets, and vehicles with fun, lively captions and action-packed images. Go behind the scenes with all of your favorite LEGO DC Comics Super Heroes and Super-Villains with this action-packed, fact-filled book. The book features information about the superpowers, weapons, vehicles, and secret identities of fan-favorite characters such as Wonder Woman, Superman, the Flash, Green Arrow, and many more. 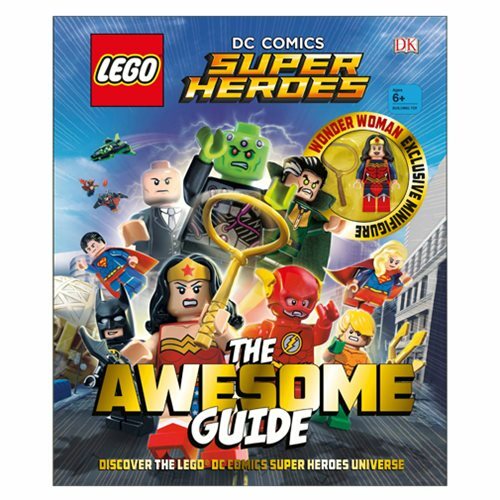 The LEGO DC Comics Super Heroes The Awesome Guide Hardcover Book comes with an exclusive Wonder Woman LEGO mini-figure. The 96 page book measures about 10 9/10-inches tall x 9-inches wide. Ages 6 and up.